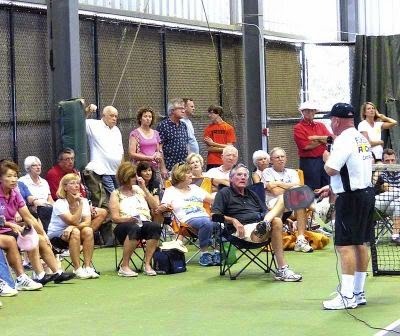 The Peachtree City Pickleball Club kicked off in Peachtree City Sunday, Oct. 12. Close to 100 friends and family members gathered at the tennis center to see what the game with the funny name was all about. Once thought to be only for the 50-plus crowd, children ages nine to 17 were out hitting whiffle-ball shots over the net, using either graphite or wooden paddles. Two of Peachtree City’s 20-somethings, Tyson Sandlin and Chris O’Brien, demonstrated the skills they learned at age 9. Sandlin’s father, Marty, built his own court 15 years ago so he could teach the neighborhood kids how to play.